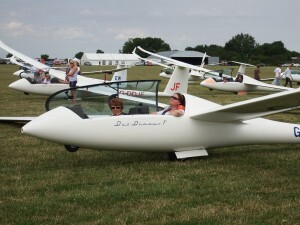 The Inter-Club League is a friendly competition among small number of nearby clubs (in our case: Gransden, The Gliding Centre – Husbands Bosworth and London Gliding Club – Dunstable). It is distributed over several weekends during the summer. For those who have not flown in competitions before, this is an excellent, low-stress introduction! The UK Finals will also be at Gransden Lodge on 30th August – 1st September, and we understand that we are allowed to field a team, even if we don’t win our region’s competition! Each club fields a team of three on each day – Novice, Intermediate, and Pundit – but the team does not have to consist of the same people on every day. The host club provides the necessary facilities including weather forecasting, task-setting, and scoring. Novices may only fly a club class glider and must not carry water ballast. Anyone can be a pundit. If desired, a pilot may fly in a higher class, e.g. a pilot qualifying for Intermediate status may be entered as his club’s Pundit. Inter-Club league dates are now published!